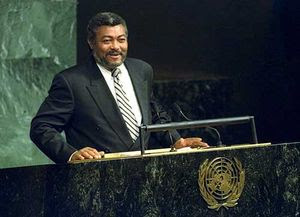 The Former President Jerry John Rawlings on Monday night left for South Africa to attend a forum on fighting corruption. A statement signed by the Special Assistant to the ex-president, Mr Victor Smith said his wife accompanied him. The five-day meeting is being co-hosted by the African Union Commission, the United Nations Economic Commission for Africa and South Africa. It is intended to consolidate Africa's anti-corruption initiatives and infuse an African perspective into the definition, perspectives and mechanism for fighting corruption.